Thou art overwhelmed with grief and tears, O Virgin Mary, standing by the cross of our Lord Jesus thy Son, the Redeemer. Remember, O Virgin mother of God, whilst thou standest in the presence of the Lord, to speak in our favour, that he may turn away his wrath from us. O God, in whose passion, according to Simeon's prophecy, the sword of grief pierced the sweet soul of glorious Mary, the Virgin Mother; grant in thy mercy that we, who with honour commemorate her sorrows and sufferings, may be helped by the glorious merits and prayers of all the saints that faithfully stood by thy cross, so as to partake of the happy fruits of thy passion. Who liveth and reigneth, world without end. Amen. 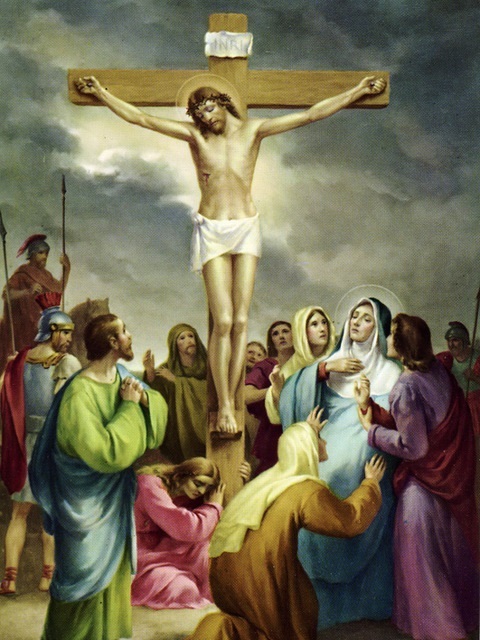 This Friday of Passion Week is consecrated, in a special manner, to the sufferings which the Holy Mother of God endured at the foot of the Cross. The whole of next week is fully taken up with the celebration of the mysteries of Jesus' Passion; and, although the remembrance of Mary's share in those sufferings is often brought before the Faithful during Holy Week, yet, the thought of what her Son, our Divine Redeemer, goes through for our salvation, so absorbs our attention and love, that it is not then possible to honour, as it deserves, the sublime mystery of the Mother's Compassion. It was but fitting, therefore, that one day in the year should be set apart for this sacred duty; and what day could be more appropriate, than the Friday of this Week, which, though sacred to the Passion, admits the celebration of Saints' Feasts, as we have already noticed? As far back as the 15th century, (that is, in the year 1423,) we find the pious Archbishop of Cologne, Theodoric, prescribing this Feast to be kept by his people. It was gradually introduced, and with the connivance of the Holy See, into several other countries; and at length,… Pope Benedict the Thirteenth, by a decree dated August 22nd, 1727, ordered it to be kept in the whole Church, under the name of the Feast of the Seven Dolours of the Blessed Virgin Mary, for, up to that time, it had gone under various names. We will explain the title thus given to it, as also the first origin of the devotion of the Seven Dolours, when our Liturgical Year brings us to the [15th] of September, the second Feast of Mary's Dolours. What the Church proposes to her children's devotion for this Friday of Passion Week, is that one special Dolour of Mary,—her standing at the Foot of the Cross. Among the various titles given to this Feast,—before it was extended, by the Holy See to the whole Church,—we may mention, Our Lady of Pity, The Compassion of our Lady, and the one that was so popular throughout France, Notre Dame de la Pamoison. These few historical observations prove that this Feast was dear to the devotion of the people, even before it received the solemn sanction of the Church. That we may clearly understand the object of this Feast, and spend it, as the Church would have us do, in paying due honour to the Mother of God and of men,—we must recall to our minds this great truth: that God, in the designs of his infinite wisdom, has willed that Mary should have a share in the work of the world's Redemption. The mystery of the present Feast is one of the applications of this Divine law, a law which reveals to us the whole magnificence of God's Plan; it is also, one of the many realisations of the prophecy, that Satan's pride was to be crushed by a Woman. In the work of our Redemption, there are three interventions of Mary, that is, she is thrice called upon to take part in what God himself did. The first of these was in the Incarnation of the Word, who takes not Flesh in her virginal womb until she has given her consent to become his Mother; and this she gave by that solemn FIAT which blessed the world with a Saviour. The second was in the sacrifice which Jesus consummated on Calvary, where she was present, that she might take part in the expiatory offering. The third was on the day of Pentecost, when she received the Holy Ghost, as did the Apostles, in order that she might effectively labour in the establishment of the Church. […] To-day we must show what part she took in the mystery of her Son's Passion; we must tell the sufferings, the Dolours, she endured at the foot of the Cross, and the claims she thereby won to our filial gratitude. On the fortieth day after the Birth of our Emmanuel, we followed, to the Temple, the happy Mother carrying her Divine Babe in her arms. A venerable old man was there, waiting to receive her Child; and, when he had him in his arms, he proclaimed him to be the Light of the Gentiles, and the glory of Israel. But, turning to the Mother, he spoke to her these heart-rending words: Behold! this Child is set to be a sign that shall he contradicted, and a sword shall pierce thine own soul. This prophecy of sorrow for the Mother told us that the holy joys of Christmas were over, and that the season of trial, for both Jesus and Mary, had begun. It had, indeed, begun; for, from the night of the Fight into Egypt, up to this present day, when the malice of the Jews is plotting the great crime,—what else has the life of our Jesus been, but the bearing humiliation, insult, persecution, and ingratitude? And if so, what has the Mother gone through?—what ceaseless anxiety? what endless anguish of heart? But, let us pass by all her other sufferings, and come to the morning of the great Friday. Mary knows, that on the previous night, her Son has been betrayed by one of his Disciples, that is, by one that Jesus had numbered among his intimate friends; she herself had often given him proofs of her maternal affection. After a cruel Agony, her Son has been manacled as a malefactor, and led by armed men to Caiphas, his worst enemy. Thence, they have dragged him before the Roman Governor, whose sanction the Chief Priests and the Scribes must have before they can put Jesus to death. Mary is in Jerusalem; Magdalene, and the other holy women, the friends of Jesus, are with her; but they cannot prevent her from hearing the loud shouts of the people, and if they could, how is such a heart as hers to be slow in its forebodings? The report spreads rapidly through the City that the Roman Governor is being urged to sentence Jesus to be crucified. Whilst the entire populace is on the move towards Calvary, shouting out their blasphemous insults at her Jesus,—will his Mother keep away, she that bore him in her womb, and fed him at her breast? Shall his enemies be eager to glut their eyes with the cruel sight, and his own Mother be afraid to be near him? The air resounded with the yells of the mob. Joseph of Arimathia, the noble counsellor, was not there, neither was the learned Nicodemus; they kept at home, grieving over what was done. The crowd that went before and after the Divine Victim was made up of wretches without hearts, saving only a few who were seen to weep as they went along; they were women; Jesus saw them, and spoke to them. And if these women, from mere sentiments of veneration, or, at most, of gratitude, thus testified their compassion,—would Mary do less? could she bear to be elsewhere than close to her Jesus? Our motive for insisting so much upon this point, is that we may show our detestation of that school of modern rationalism, which, regardless of the instincts of a mother's heart and of all tradition, has dared to call in question the Meeting of Jesus and Mary on the way to Calvary. These systematic contradictors are too prudent to deny that Mary was present when Jesus was crucified; the Gospel is too explicit,—Mary stood near the Gross (St. John, xix. 25): but, they would persuade us, that whilst the Daughters of Jerusalem courageously walked after Jesus, Mary went up to Calvary by some secret path! What a heartless insult to the love of the incomparable Mother. No,—Mary, who is, by excellence, the Valiant Woman (Prov, xxxi. 10), was with Jesus as he carried his Cross. And who could describe her anguish and her love, as her eye met that of her Son tottering under his heavy load? Who could tell the affection, and the resignation, of the look he gave her in return? Who could depict the eager and respectful tenderness wherewith Magdalene and the other holy women grouped around this Mother, as she followed her Jesus up Calvary, there to see him crucified and die? The distance between the Fourth and Tenth Station of the Dolorous Way is long:—it is marked with Jesus' Blood, and the Mother's tears. Jesus and Mary have reached the summit of the hill, that is to be the Altar of the holiest and cruelest Sacrifice: but the divine decree permits not the Mother as yet to approach her Son. When the Victim is ready, then She that is to offer him shall come forward. Meanwhile, they nail her Jesus to the Cross; and each blow of the hammer was a wound to Mary's heart. When, at last, she is permitted to approach, accompanied by the Beloved Disciple, (who has made amends for his cowardly flight,) and the disconsolate Magdalene and the other holy women,—what unutterable anguish must have filled the soul of this Mother, when, raising up her eyes, she sees the mangled Body of her Son, stretched upon the Cross, with his face all covered with blood, and his head wreathed with a crown of thorns! Here, then, is this King of Israel, of whom the Angel had told her such glorious things in his prophecy! Here is that Son of hers, whom she has loved both as her God and as the fruit of her own womb! And who are they that have reduced him to this pitiable state? Men,—for whose sakes, rather than for her own, she conceived him, gave him birth, and nourished him! Oh! if, by one of those miracles, which his Heavenly Father could so easily work, he might be again restored to her! If that Divine Justice, which he has taken upon himself to appease, would be satisfied with what he has already suffered!—but no; he must die; he must breathe forth his blessed Soul after a long and cruel agony. Amidst the shouts and insults vociferated by the enemies of Jesus, Mary's quick ear has heard these words, which tell her, that the only son she is henceforth to have on earth is one of adoption. Her maternal joys of Bethlehem and Nazareth are all gone; they make her present sorrow the bitterer: she was the Mother of a God, and men have taken him from her! Her last and fondest look at her Jesus, her own dearest Jesus, tells her that he is suffering a burning thirst, and she cannot give him to drink! His eyes grow dim; his head droops;—all is consummated! Mary cannot leave the Cross; love brought her thither; love keeps her there, whatever may happen! A soldier advances near that hallowed spot; she sees him lift up his spear, and thrust it through the breast of the sacred Corpse. “Ah,” cries out St. Bernard, “that thrust is through thy soul, O Blessed Mother! It could but open his side, but it pierced thy very soul. His Soul was not there; thine was, and could not but be so.” No, the undaunted Mother keeps close to the Body of her Son. She watches them as they take it down from the Cross; and when, at last, the friends of Jesus, with all the respect due to both Mother and Son, enable her to embrace it, she raises it upon her lap, and He that once lay upon her knees receiving the homage of the Eastern Kings, now lays there cold, mangled, bleeding, dead! And as she looks upon the wounds of this divine Victim, she gives them the highest honour in the power of creatures,—she kisses them, she bathes them with her tears, she adores them, but oh! with what intensity of loving grief! The hour is far advanced; and before sunset, he,—Jesus,—the author of life,—must be buried. The Mother puts the whole vehemence of her love into a last kiss, and oppressed with a bitterness great as is the sea (Lament, i. 4; ii. 13), she makes over this adorable Body to them that have to embalm and then lay it on the sepulchral slab. The sepulchre is closed; and Mary,—accompanied by John, her adopted son, and Magdalene, and the holy women, and the two disciples that have presided over the Burial,—returns sorrowing to the deicide City. Now, in all this, there is another mystery besides that of Mary's sufferings. Her dolours at the Foot of the Cross include and imply a truth, which we must not pass by, or we shall not understand the full beauty of to-day's Feast. Why would God have her assist in person at such a scene as this of Calvary? Why was not she, as well as Joseph, taken out of this world before this terrible day of Jesus' Death?—Because God had assigned her a great office for that day, and it was to be under the Tree of the Cross that she, the second Eve, was to discharge her office. As the heavenly Father had waited for her consent before he sent his Son into the world; so, likewise, he called for her obedience and devotedness, when the hour came for that Son to be offered up in sacrifice for the world's Redemption. Was not Jesus hers? her Child? her own and dearest treasure? And yet, God gave him not to her, until she had assented to become his Mother; in like manner, he would not take him from her, unless she gave him back. But, see what this involved, see what a struggle it entailed upon this most loving Heart! It is the injustice, the cruelty, of men that rob her of her Son; how can she, his Mother, ratify, by her consent, the Death of Him, whom she loved with a twofold love,—as her Son, and as her God? But, on the other hand,—if Jesus be not put to death, the human race is left a prey to Satan, sin is not atoned for, and all the honours and joys of her being Mother of God are of no use or blessing to us. This Virgin of Nazareth, this noblest heart, this purest creature, whose affections were never blunted with the selfishness which so easily makes its way into souls that have been wounded by original sin,—what shall she do? Her devotedness to mankind, her conformity with the will of her Son who so vehemently desires the world's salvation, lead her, a second time, to pronounce the solemn FIAT:—she consents to the immolation of her Son. It is not God's justice that takes him from her; it is she herself that gives him up;—but, in return, she is raised to a degree of greatness, which her humility could never have suspected was to be hers:—an ineffable union is made to exist between the two offerings, that of the Incarnate Word and that of Mary; the Blood of the Divine Victim, and the Tears of the Mother, flow together for the redemption of mankind. Thus, this Mother of Sorrows, when standing on Calvary, blessed us who deserved but maledictions; she loved us; she sacrificed her Son for our salvation. In spite of all the feelings of her maternal heart, she gave back to the Eternal Father the divine treasure he had entrusted to her keeping. The sword pierced through and through her soul,—but we were saved; and she, though a mere creature, cooperated with her Son in the work of our salvation. Can we wonder, after this, that Jesus chose this moment for the making her the Mother of men, in the person of John the Evangelist, who represented us? Never had Mary's Heart loved us as she did then; from that time forward, therefore, let this second Eve be the true Mother of the living! (Gen, iii. 20) The Sword, by piercing her Immaculate Heart, has given us admission there. For time and eternity, Mary will extend to us the love she has borne for her Son, for she has just heard him saying to her that we are her children. He is our Lord, for he has redeemed us; She is our Lady, for she generously co-operated in our redemption. Animated by this confidence, O Mother of Sorrows! we come before thee, on this Feast of thy Dolours, to offer thee our filial love. Jesus, the Blessed Fruit of thy Womb, filled thee with joy as thou gavest him birth; we, thy adopted children, entered into thy Heart by the cruel piercing of the Sword of Suffering. And yet, O Mary! love us, for thou didst co-operate with our Divine Redeemer in saving us. How can we not trust in the love of thy generous Heart, when we know, that, for our salvation, thou didst unite thyself to the Sacrifice of thy Jesus? What proofs hast thou not unceasingly given us of thy maternal tenderness, O Queen of Mercy! O Refuge of Sinners! O untiring Advocate for us in all our miseries! Deign, sweet Mother, to watch over us, during these days of grace. Give us to feel and relish the Passion of thy Son. It was consummated in thy presence; thine own share in it was magnificent! Oh! make us enter into all its mysteries, that so our souls, redeemed by the Blood of thy Son, and helped by thy Tears, may be thoroughly converted to the Lord, and persevere, henceforward, faithful in his service. In honour of the Sorrows of the Blessed Virgin Mary. Click here, for the Latin version. Happy senses of the blessed Virgin Mary, who without dying, merited the crown of martyrdom, under the cross of the Lord.